Urghhh.... I think 1985 want their silverware back.... or goldware. Looks a nice set quality wise they was 30 then 15 and now 7.50. They're not as good as they look in reality. I bought a set recently but they are quite lightweight and the plastic feels cheap. Probably worth a punt at £7.50 Not worth £30 at all. Don't throw them out then! I burn mine! You can avoid landfill by throwing it directly into the sea. True story. 18/10 steel, they look great and should really last. My local branch had about 7 boxes. Now has 6. Thanks OP! Can't go wrong at that price. Wore these all day yesterday to test them out, surprisingly comfortable for a cheap shoe, and the fit is quite generous. Obviously I don't know how durable they're going to be but if you're looking for work shoes then for £12 delivered I don't think you can go wrong. The great thing about these is that you can dress them up with a suit for that important job interview or promotion. Thanks, ordered, have some heat. He’s got bored of bending spoons and moved onto Brexit these days! Hurrah for our saviour. Brill. I was just about to go buy some, daughter constantly loosing spoons from her lunch box. 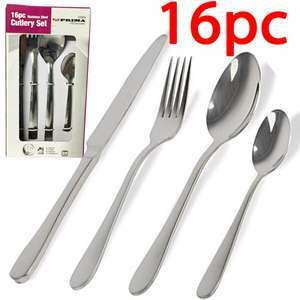 Never miss a 'Cutlery' deal again! Can't see option to click and collect? Uri Geller uses these, easy to bend. Just got my 2 sets and it seems to be very well made with no issues at all. I have never paid delivery on amazon ever. Just club it with something else to get over the £20 free postage threshold. 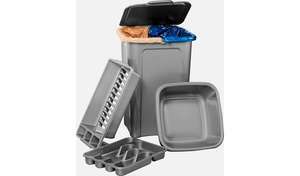 If you compare the same 48 piece set on groupon it is £29+£2 = £31. 2 of these = £30. Which is what I purchased with free delivery and better value. Anyway, all expired now. Sabichi marble 16 pieces cutlery set reduced from £20 to £5 Tesco in store found in Tesco store Bedworth. I was thinking the marble effect bits might come off. I got the last set in my Tesco last week then thought about giving it back. Don’t ask me why. Voted hot but then noticed it's Stainless Steel colour, and chrome plated. Rust-tastic! Misleading title OP. Good price. Cutlery, including desert spoons, stick out the sides. Hateful when they slide half out and lay flat or a really sharp knife sticks out the bottom 2 inches while i'm rushing and nearly slicing myself. Saucepan drying is like all others - a quick shake in the air and back on the hob then stack them. "Stainless steel color dish drainer ..... Durable chrome-plated steel construction. Can't be both OP - bet it's plated, in which case save your money! I've been using mine for a month it's fine. Not sure why everyone's is breaking? Dumb question, what does everyone do about saucepans with these types of rack? 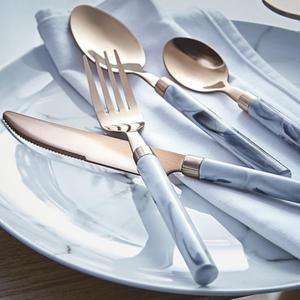 Seems like a nice set of cutlery, currently selling at Sophie Conran's own store and John Lewis for £215. I use 'nice' cutlery and it makes the eating experience better. Sophie Conran's too. According to research, yes: https://www.wired.co.uk/article/heavy-cutlery-food-taste-better There was a good article in The Economist on it, which I can't find. Also food is meant to taste sweeter if you eat it with your fingers (e.g. lick your fingers). You also get desert/starter forks and knives, and soup spoons. And it should last longer, and look nicer and feel better. Having said that I don't like this design, far too fussy for me. Smaller knives and forks are great though, 6 or 7 piece is where it's at. £90, Does food taste any better? 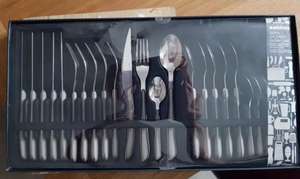 The smaller 16 and 24 piece sets along with things like mug spoons are often in TKmaxx or Homestore pretty cheap if you want extra bits or a smaller set. No "House Atreides" crest put me off buying this; especially as there isnt even a spice dispenser; what would the God Emporer say?.